By author: Rufus Burrow Jr. The first book to explore Walker’s social activism in light of his religious convictions Before now, no writer has sought to systematically relate David Walker to the tradition of eighth-century BCE Hebrew prophecy (Amos, Hosea, Micah, Isaiah). He is generally portrayed in the literature as a black nationalist militant Christian abolitionist of the first third of the nineteenth century. He is also presented as one who advocated indiscriminate violence against whites. God and Human Responsibility takes issue with this approach and presents Walker as a dedicated Christian and nominally free black who took his faith so seriously that he could do no less than advocate for and work toward the full emancipation of his people from slavery. Walker took seriously God’s expectation that justice be done in righteous ways and that persons respect the humanity and dignity of self and others, fundamental claims of the Hebrew Prophets. The argument of this book sees Walker’s social activism as grounded in such religious convictions. Much like the Hebrew prophets, Walker’s insistence that justice be done to his people was at times viewed as fanatical. But Burrow argues that such behavior was consistent with the eighth-century prophetic tradition. 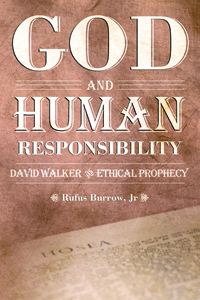 Burrow further argues that Walker’s commitment and behavior should serve as an example to would-be-religious-based social activists today. Considered a study in prophetic ethics, the claim is made that not nearly enough has been written on the subject. Burrow’s book fills this void.